스티비 어워즈의 2018 대상 프로그램들의 은상과 동상 수상자들에게 수여될 스티비 은메달과 동메달의 첫 사진을 여러분께 공유하게 되어 기쁘게 생각합니다. 이번 메달은 2016-17년도에 사용된 삼각형 모양이 아닌 다이아몬드 모양으로, 스티비 어워즈의 로고를 연상시킵니다. 스티비 은메달은 연청색 증정 상자에, 스티비 동메달은 황록색 상자에 담겨 수여됩니다. 메달들은 2018년 2월 23일(금) 라스베가스에서 열리는 제12회 연례 영업 및 고객서비스 스티비대상의 은상과 동상 수상자들에게 처음으로 수여될 것입니다. 전처럼, 은상과 동상 수상자들은 자동적으로 한 개의 메달을 받게 됩니다. 수상자들은 추가적으로 메달이나, 이에 상응하는 스티비 은트로피와 동트로피를 스티비 어워즈 온라인숍에서 구매할 수 있습니다. The Stevie Awards are excited to announce our new representative in the Philippines, GeiserMaclang Marketing Communications. GeiserMaclang has joined the team as we are accepting entries for the Asia-Pacific Stevie Awards, the newest Stevie Awards program, and The International Business Awards. 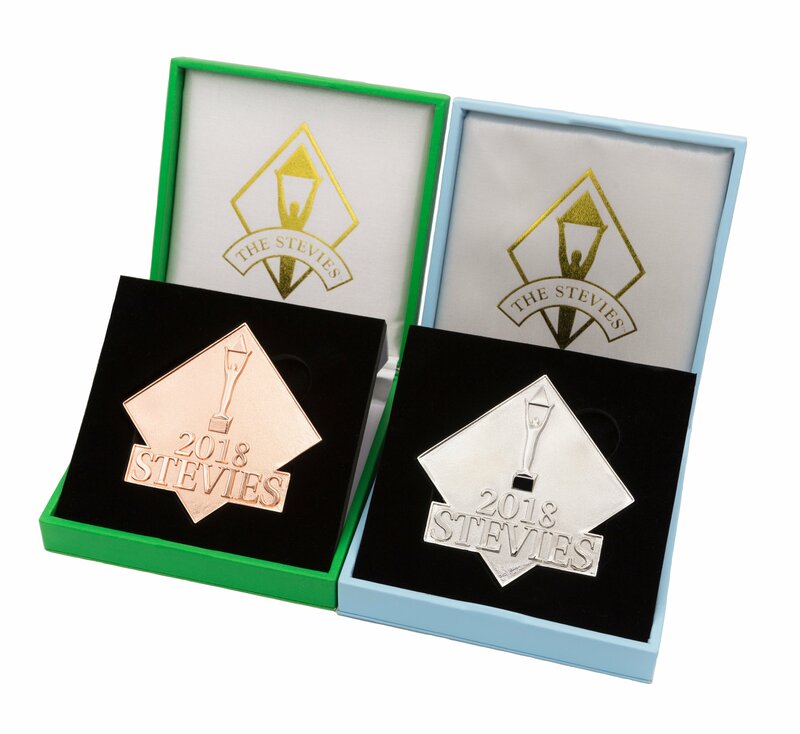 Get your entry kit and full details on the competitions at Asia.StevieAwards.com and www.StevieAwards.com/IBA, respectively. Since it began operations in 2000, GeiserMaclang has grown to become the communications arm of leading names in a diverse field of industries—representing the number 1 and number 2 brands in real estate, fashion, lifestyle brands, the paint industry, pharmaceuticals and fast moving consumer goods. Responsible for many methods and techniques now often duplicated by the rest of the industry, GeiserMaclang was behind several industry firsts, including: 3D invites, which have been recognized as a signature GeiserMaclang innovation by members of the media; hosting of the very first blogger event in the Philippines; the very first viral-social email promotion to consistently drive walk-ins and sales; as well as the introduction of a new generation of national awareness campaigns. GeiserMaclang has also pioneered the idea that Corporate Social Responsibility is not enough—organizations should make money based on how much they help people using marketing campaigns as operational evidence of their validity. As a company, GeiserMaclang has always made it a point to do well by doing good—a practice that is intrinsic to their business model. Given this, GeiserMaclang practices what they preach by integrating social relevance into virtually every campaign they create. Today, GeiserMaclang—which just recently celebrated its 10th year is an internationally awarded, regionally recognized company—is known for innovation and strategic marketing in the communications industry. And in the coming years, you can certainly expect the company to continue making waves, inspiring word-of-mouth and moving brands to make an impact in the most socially relevant way possible.